Something interesting happens when you try to cram a computer into a small case without much room for cooling. It gets hot. Most laptops I’ve used have been a little to hot to actually rest on your lap if you’re wearing shorts. And mini-notebooks can get even hotter. The HP Mini-Note is one of the hottest, with bottom-of-the-unit temperatures hitting 114 degrees Fahrenheit. The folks at Laptop Magazine decided to see how the MSI Wind laptop stacks up against the Mini-Note, Eee PC, and other subnotebooks. And the answer? The wind is pretty darn cool (relatively speaking). 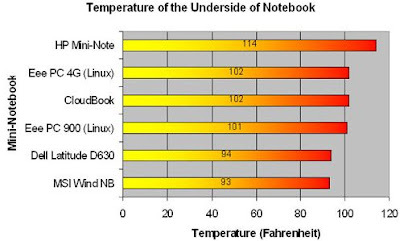 The underside of the computer hits just 93 degrees, which is a full 21 degrees cooler than the HP Mini-Note, and several degrees lower than the Eee PC 4G, Eee PC 900, or Everex Cloudbook. The keyboard registers about the same temperature, while the touchpad hits 99 degrees during use, which is hotter than the HP Mini-Note or Everex Cloudbook, but slightly cooler than the Eee PC. Temperature isn’t a make it or break it feature for me. But it’s nice to know that you don’t need to wear thick pants to use the MSI Wind laptop comfortably. it’d be interesting to see where the 901 falls on that list. I think it would most likely be right above or right below the wind, since they use the same processors, although the case differences might affect it.